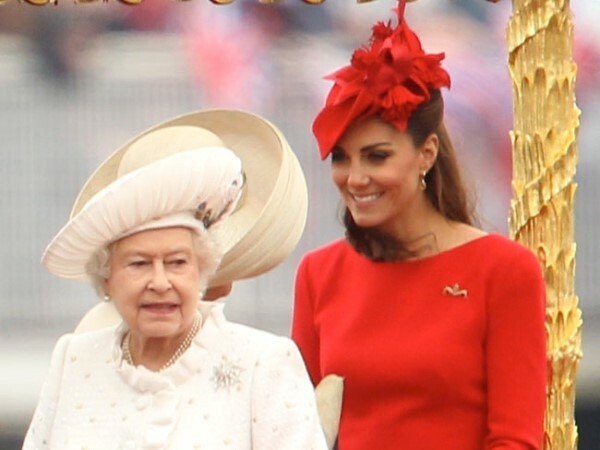 Britain's Queen Elizabeth has reportedly been offering Duchess Catherine advice about her duties and personal style ahead of her royal tour of Australia and New Zealand. Britain's Queen Elizabeth has been giving Duchess Catherine advice about her royal visit to Australia and New Zealand. The monarch has reportedly taken the 32-year-old duchess "under her wing" in order to prepare her for the historic visit to the Commonwealth countries in April. A palace source told the Sunday Express newspaper: "The Queen regards Catherine as the perfect partner for William and she thinks they are a great team. She doesn't want to see a repeat of Charles and Diana when they toured Australia and the crowds were only interested in meeting Diana. "Most importantly, the Queen can pass on her knowledge of the countries, their cultures, histories and the dos and don'ts of what to say and not say." Aside from sharing her pearls of wisdom, the 87-year-old ruler is said to have given Catherine - who has seven-month-old son Prince George with Prince William - access to her royal jewellery box for the three-week trip. This comes after the Queen loaned her the Nizam of Hyderabad diamond necklace, which was a wedding gift in 1947, for her appearance at the National Portrait Gallery earlier this month. Elizabeth is also said to have advised the mother-of-one to have small weights sewn into her dress hems to prevent future "Marilyn Monroe" moments in strong winds.